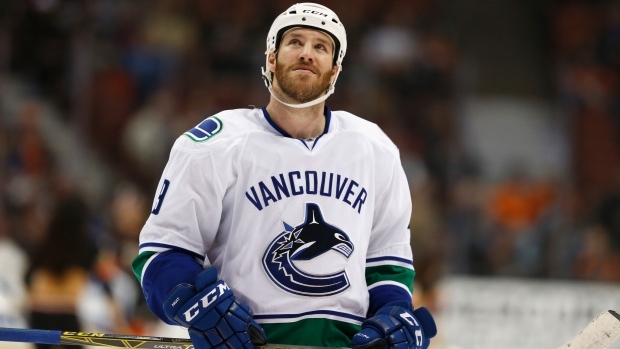 Brandon Prust is rejoining the OHL's London Knights, this time as a coach. Prust posted a photo to his Instagram account Tuesday, wearing Knights gear with the caption "1st day as a coach! Exciting stuff! @londonknightsohl"
The 33-year-old forward spent training camp for the 2017-18 season with the Los Angeles Kings on a professional tryout, but failed to earn a contract from the club. Prust last played in the NHL during the 2015-16 season, appearing in 35 games with the Vancouver Canucks. He appeared in 29 games last season with Germany's Nuremberg Thomas Sabo Ice Tigers of the Deutsche Eishockey (German Elite) League. Prust spent three seasons with the Knights from 2002-05. He won the Memorial Cup with the team in 2005, moving to the AHL the following season. In 486 career NHL regular-season games, the London, Ont., native posted 40 goals, 115 points and 1,036 penalty minutes. He also appeared in 53 playoff games, scoring two goals and adding 10 assists.